I like Compete. The traffic gauge shows signs of promise. It just needs more data. Their blog is in my Google Reader and it reminds me of Hitwise's. A good model to follow. I sometimes look at Netcraft's topsites to see what the market is doing. I remember how gmail caused the https://mail.google.com domain to rocket up through the ranks. Look how much traffic eBay.de gets. Okay. The figures may be a little awkward. 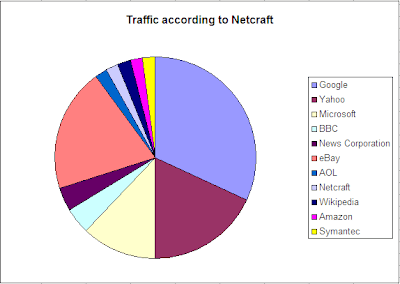 This traffic is collected by the Netcraft Toolbar and Netcraft's Toolbar URL appears in the top 50. This pie chart looks at the top 50. Netcraft records the top 100.